The exorcism thriller “The Priests” topped 3 million ticket sales as of Saturday, box-office data showed Sunday. Since its release on Nov. 5, the film was watched by 3.12 million viewers as of Saturday, including a daily viewer count of 460,160 registered on that day, according to the state-run Korean Film Council. The record is on the same pace as box-office hits “Masquerade” (2012) and “Ode to My Father” (2014), which both crossed the coveted 10 million mark, its distributor CJ Entertainment said. 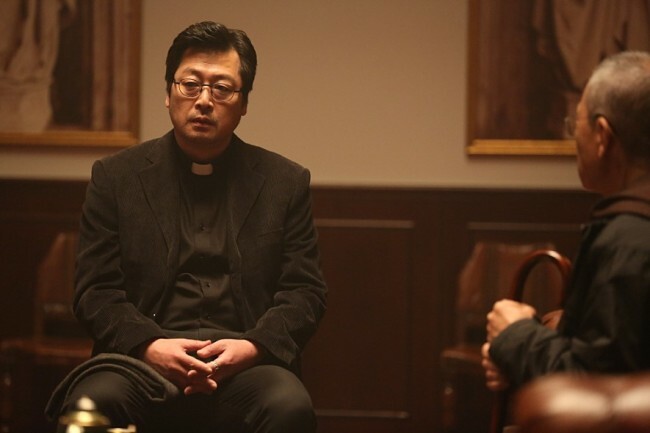 Directed by Jang Jae-hyun, “The Priests” stars Kim Yun-seok and Kang Dong-won as a priest and deacon, respectively, who decide to perform an exorcism to save a girl from danger. Rookie actress Park So-dam plays the girl possessed by a demon. In this flick, Kim and Kang joined up for the first time in six years since their box-office hit “Woochi” in 2009.